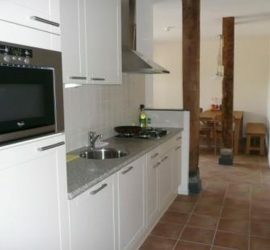 In the summerhouse of the farm you will find the one bedroom apartment Den Moeder. On the farm are 4 two bedroom apartments. 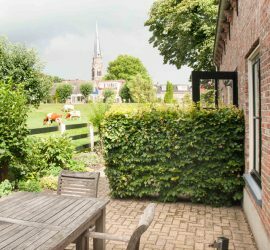 In the old stable of the Sint Nicolaashoeve the three bedroom apartment Jan Nederstadt is situated. When you walk, cycle or drive on the small dyke to the Sint Nicolaashoeve, the world appears to stop there. However on arrival of this historic farm, you will soon notice that the world only just begins. At the farm you will find rest, space and enjoy the real farm life. With cities such as Amsterdam, The Haque and Utrecht only a stones throw away, the farm is an ideal leaving point for a varied holiday. And it is a really special location for your meeting. Active farm with many animal and farm activities. In the middle of the Green Heart with lots of meadows, cows and windmills. Plenty of opportunities to walk, cycle and for boating. 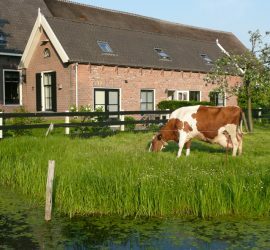 The village Nieuwveen is only 300 meter from the farm with shops, restaurants and cycle hire. The cities Amsterdam, Den Haag, Leiden, Gouda, Delft, Rotterdam en Utrecht are 20-40 km away. Your holiday or meeting starts with the Sint Nicolaashoeve!